Looks like Snoop Dogg is going to have to go buy some new underwear tonight. Today was National Signing Day for high school students to announce where they’ll be playing football next year. Cordell Broadus, Snoop’s son, is a four-star wide receiver recruit who is ranked 130th in the ESPN 300, not to mention he’s also an Under Armour All-American. Where the highly touted Broadus would play next season has been a serious topic, mainly because Snoop is a HUGE USC fan. So where did the 6’2 receiver commit to? Yes, those Bruins. The rival of USC. You’d think that such a move would make his overly calm father, riled up and upset, but his action was the complete opposite. Snoop supports his son and is going to back him “1000 percent”, which means even throwing away all his red USC drawers. 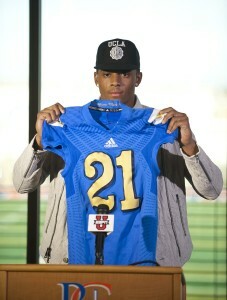 He even wore a UCLA jersey to the press conference. You know that inside Snoop was dying inside, but to throw away all of his underwear, now that’s support.